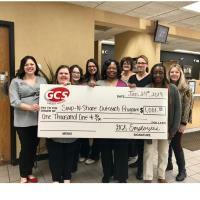 Madison, IL - GCS Credit Union employees joined together to raise $1,001.00 in the month of January to benefit the local Soup-N-Share Outreach Program. In an ongoing effort to support the local community, GCS employees participate in Jeans Days each month. In exchange for a donation of $15 or more, employees are allowed to wear jeans on Fridays and Saturdays during the month of January. The mission of the Soup-N-Share Outreach Program is to eliminate hunger in the community and surrounding areas by distributing food to families who need help, offer free clothing, and educational resources to individuals who are in need. To volunteer an afternoon to stock food pantry items and see first-hand the families who are helped weekly, email Sherrie Hare at sherrie@soupnshare.org. To find out more information about Soup-N-Share Outreach Program, please visit SoupNShare.org. To find out more about GCS, visit myGCScu.com.